Arrange your guest favours in the centre of the table to create a centerpiece! 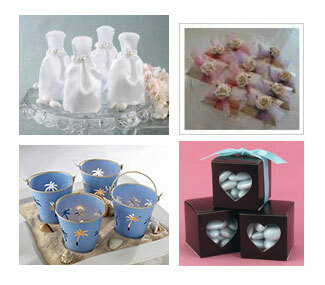 Most favours are beautifully decorated whether they are in boxes or done up with pretty ribbons. Whatever the case may be, when several favours are assembled in the centre of the table, they can create a beautiful centerpiece, thus, eliminating the necessity (and cost) of having separate arrangements done for the tables. At the end of the night, each guest will take their favour with them; therefore, you don't have to worry about distributing or disposing of the centerpieces after the wedding. So easy! Find thousands of Wedding Guest Favours in our directory..